Most appreciate the eclectic and minimalist approach to the shoe design. Majority of reviewers liked the boot’s all-black color and clean finish. Some customers love the lightweight and bouncier Tubular-like sole unit of the Adidas Y-3 Qasa Boot that is well complemented by the elastic straps and neoprene upper materials. A select number of users found the upper materials well ventilated and breathable. Lined with performance Poron cushioning sock liner throughout the interior, some buyers claim these made the Adidas Y-3 Qasa Boot comfortable and hug the feet. Many observers are impressed that designers did not scrimp on materials as the boot is finished with premium leather and a carbon fiber-like textile. Several customers appreciate the trademark Yohji Yamamoto silhouette, incorporating well the Eastern and Western influences in the design. Adidas values of a confident sense of style and a willingness to innovate were projected well in the design aesthetics. Quite a lot were captivated by the dark hues used in the three colorways of the Adidas Y-3 Qasa Boot. Some wearers appreciate the good placement of the Yohji Yamamoto branding at the forefront and the Y-3 logo detailing at the sole and heel back as it is not too flashy yet adds glamor to the shoe. 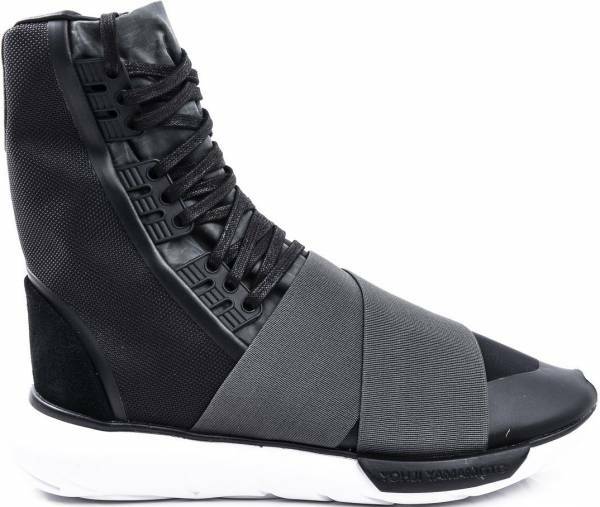 A few of those who tried the Adidas Y-3 Qasa Boot found the shoe lacking in arch support. One blog reviewer ended up disappointed that while the shoe looks good visually but felt unsecured with the thin boot upper material where the feet don't feel secure. Some claimed the $420 original price is too much for this type of shoe and would rather only buy them while on sale and discounted prices. Some customers claim the highly-modern style is sometimes hard to pull-off when wearing the shoe as it also requires edgier clothing compared to just casual wear. For a premium priced sneaker, the Adidas Y-3 Qasa Boot boasts of top of the line materials and a perfect blend of design elements and innovation resulting from the collaboration between German footwear manufacturer Adidas and influential Japanese designer Yohji Yamamoto. The premium leather finishing and subtle design detailing give this shoe a high-end treatment. Despite its premium pricing, many sneaker fans love this shoe for giving real value for money with the use of high quality and high-end materials. German footwear giant Adidas started collaborating with Tokyo and Paris-based designer Yohji Yamamoto in 2002 with the launch of the Y-3 clothing and shoe line which boosted the brand’s sales and helped push Adidas even further when in high fashion and modern design circles. Y-3 is a symbolic line for both Adidas and Japanese designer as the “Y” stands for Yamamoto while “3” symbolizes the Three Stripes logo associated with the German brand. Yamamoto brought to fore his well- known avant-garde tailoring featuring Japanese design aesthetics into cutting-edge clothing and footwear. The futuristic design features a woven textile upper, mesh heel collar, elastic bands, inner zip, molded rubber details, Poron performance cushioning sock liner, and a Tubular outsole in EVA. The science fiction-inspired looks blends well neoprene, leather and mesh finished with a Tubular outsole ideal for all types of weather conditions and cushioning needs. “Ten years ago, together with Adidas, we created something that did not exist before and completely projected the future. My desire was and is to make sportswear elegant and chic. Adidas is a very personal inspiration to me,” Yamamoto said in a quote posted in the official Y-3 website in 2011. Lifting the brand’s classic Qasa model, Y-3 has created a boot for the Fall 2016 season with a silhouette that has traditionally ignored both convention and history. With an elevated sole compared to the Y-3 Qasa, designers added six more sets of eyelets to heighten the aesthetics of the sleek futuristic boot. Sneaker fans will also find premium leather and a carbon fiber-like textile on the upper, while a performance Poron lining completes the major features on the boot. In terms of style, the Y-3 line of Yohji Yamamoto incorporates both Eastern and Western influences in streetwear highlighting the importance of minimalism from the East and the futuristic silhouette of the West. At the heart of the design process of Adidas and reflected well in its style are a confident sense of style and a willingness to innovate which designer Yamamoto best exemplifies in the Y-3 line. The Adidas Y-3 Qasa Boot offers colorways in darker shades and tones Core Black, Utility Black, and Charcoal. This next-level silhouette offers a luxurious appeal finishing up with an extensive premium leather detailing and the Y-3 branding on the tongue and heel back. The Adidas Y-3 Qasa Boot generally runs true to size. The foot is kept snug by a brass zipper conspicuously placed on the sides, and elastic band hugging the Poron performance cushioning sockliner and three-stripes inspired eyelets that hold the waxed cotton shoelaces together. The shoe is available in men’s sizes in medium width. US size ranges from 6.5 to 13. It is difficult to ignore the Poron performance cushioning sockliner and the Tubular outsole in molded EVA that distinguishes well this Y-3 boot. The Poron cushioning sock liner keeps the feet comfortable all day. The Poron material produced by Rogers Corporation provides great underfoot cushioning to absorb shock and keep feet comfortable whether it is a marathon day at work or running a marathon. Meanwhile, the tubular outsole is gaining popularity among sneaker fans. While the shoe designs coming out might have been new, the technology is nothing futuristic as the Tubular technology has been around in the 1980s and was originally inspired by road tires.It was kept in the company’s archives and only recently resurrected and created a whole new line that has risen in popularity over the past years. Celebrities spotted wearing the Adidas Y-3 Qasa Boot and other Y-3 models include Swizz Beatz, Kanye West, ASAP Rocky, and Joe Jonas. High top sneakers feature a woven textile upper and tongue and a mesh heel collar. Inner zip is made of a tough brass material that easily secures the upper portion for easy entry.